Looking forward to seeing you tonight - All tickets will now be sold at the door. Please join us again at Meridian 23 on Saturday December 6 for another edition of International Night Out ( Food Music People Dance). Thanks for all the support for all our past events. Food by Panla. DJ SM and DJ E'Love bringing you the best of Afrobeats, Soukous, Soca, Coupe Decale, Kwaito and more. Live Performance by Olutayo - more details coming soon. Purchase tickets at discounted rates today. 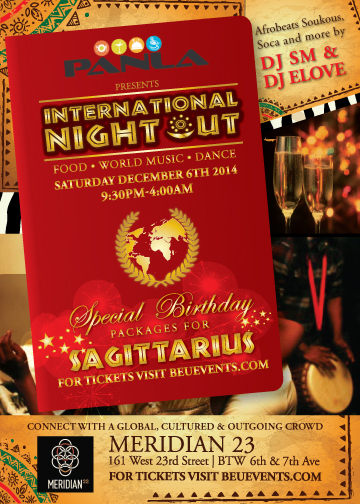 All Sagittarius book your birthday party with us - promises to be a beautiful night with friends.